Has a total of over 950 species of birds on his list. 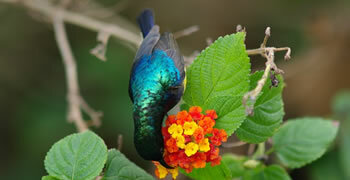 First choice national bird guide in Uganda. In 1994/95: Trained by the then Forest Department (FD) as site guide in Avi-fauna and flora. The areas of concentration were; Birds’ identification, butterflies, tropical vegetation, ecological interpretation, and game and primate identification. Since 1995-2007: Guiding tourists with different national and international tour companies which has exposed him to several tour destinations and Important Bird Areas (IBAs) in Uganda and the whole of Virunga Conservation Area (VCA). He has the skills to handle amateurs and skilled bird watchers (twitchers). 2001: Successfully completed a driving course. Driving since then, with a very clean record. In 2001: Trained under the National Bird Guides Club as a national bird guide; and since then he has been doing a self-guided research about birds in different habitats, identifying them by sights and sounds. 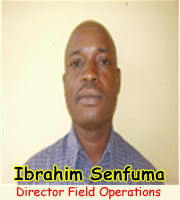 2003: Ibrahim trained in the basics of first aid and rescue skills. 2003/2004: Ibrahim updated the birds’ list for Uganda’s tropical forests; a duty assigned to him by the Forest Department (FD) after realizing his competence in birds identification. 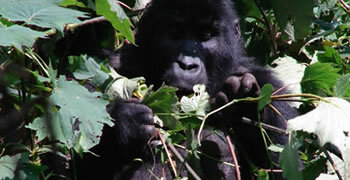 2003/2004: He trained site guides of Kalinzu and Mpanga forests in birds and primate identification. This exercise widened his knowledge about avifauna and flora. 2004/2005: Trained by the National Hotel and Tourism Training Institute in tour guiding. 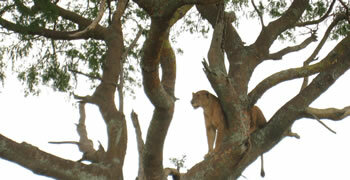 2006: Did a birds’ inventory with Adrift Adventure Company along the Mighty Nile River. Identifying the birds by sounds and sights; an exercise which exposed him to a number of water birds. 2008: Involved in a Birds’ Inventory in all the Rainforests of Uganda identifying them by sights and sounds with British Trust for Ornithology (B.T.O). Ibrahim Ssenfuma is a member of Nature Uganda and National Bird Guides Club.